This year make your Valentines Day Gift even more special with a handcrafted gift made in Ireland. Medium sized Crystal Sphere Suncatcher, engraved with ‘I Love you to the Moon and Back. Handmade from native Irish Oak, with a quality Asfour Crystal Sphere prism. In direct sunlight the crystal sphere acts as a prism to produce an array of rainbows. 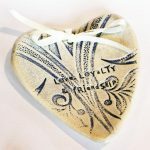 Ceramic heart shaped dish, perfect bedside dish for rings, coins and keys. Impressed famous Irish Claddagh motto ‘Love, Loyalty & Friendship. Available in blue, red or green, with different patterns. Quality handcrafted sterling silver pendant, hallmarked in Assay Office, Dublin Castle. 2 swans embrace forming a heart, inspired by the famous Celtic legend of the Children of Lir. Dainty 15mm pendant on a 18″ chain. Ancient Irish bog turf cut in the shape of two hearts and frame. Entitled ‘Love You’ written on the mount, option to personalise. In a dark brown frame with cream mount, 25 cm x 18 cm. Top quality jewellery hallmarked by the Assay Office in Dublin Castle. Matching Cloicin Heart Earrings (€50) available to create a beautiful Valentines Jewellery Set. Dainty heart necklace with tiny raised silver stones inspired by the pebbles of Carlingford. 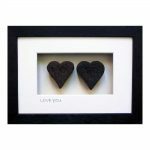 This year show him how much he means to you with a Valentines Day Gift handcrafted in Ireland. 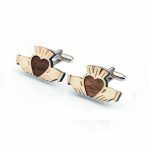 A beautiful pair of lightweight wooden Claddagh Cufflinks. Made from Irish Sycamore (light wood) and American Walnut (dark wood). 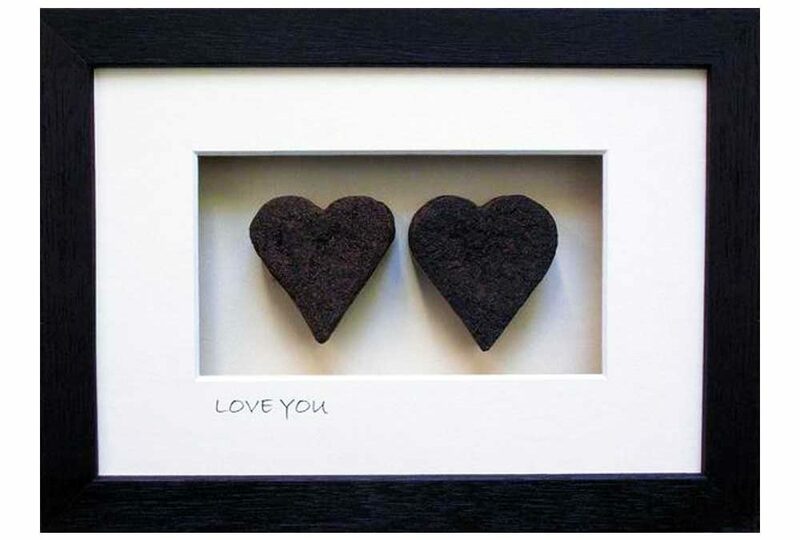 Ancient Irish bog turf cut in the shape of one heart and one shamrock set in a framed. Entitled ‘Love Irish’ written on the mount, option to personalise. Print of an original work by artist Fran Leavey. Titled “I Knew I’d Find You” & signed by the artist. 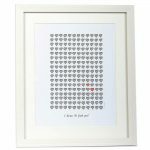 Two red hearts meet among all the grey hearts in this clever print. The word grá engraved in Ogham, the earliest form of Irish writing dating from c.4th century. ‘Grá’, the Irish word for love, is also engraved under the Ogham script. Handcrafted from a mix of bronze and limestone, highlighted with gold leaf script. 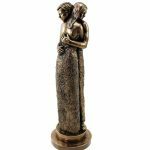 Bronze statue with two lovers embracing, showing true love and affection. A ghrá mo chroí is the Irish term for ‘my darling’, literaly translated ‘the love of my heart’. Last Order dates for delivery prior to Valentines Day, order by 4 p.m.